Ever wonder exactly what the most watched games are on Twitch? It shouldn’t be too much of a surprise given what’s constantly in the featured slot on the site when you browse channels. 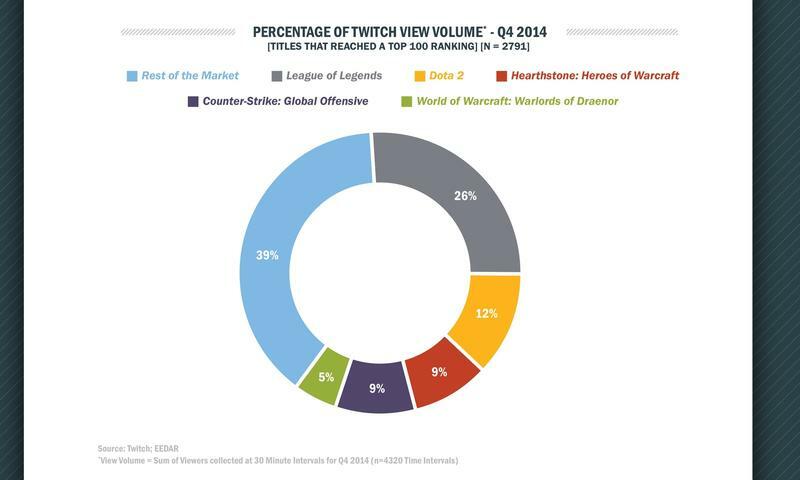 A study done by EEDAR has resulted in a fancy pie chart that shows the “percentage of Twitch view volume” for Q4 2014. The rundown is all stuff you’d expect to see, but the sheer percentage of viewership the top five games command is sort of astounding. In order of most-to-least viewership command, we have League of Legends, Dota 2, Hearthstone: Heroes of Warcraft, Counter-Strike: Global Offensive and World of Warcraft: Warlords of Draenor. Like I said, a totally to be expected rundown. What’s crazy is that those five games make up 61 percent of the view volume on Twitch. At least, they did during Q4 of 2014. The rest of the market, that means every other game broadcasted on the service, represents only 39 percent of all viewership. Crazy. The same report revealed that when big releases drop, the viewership volume is temporarily disrupted. So, Call of Duty: Advanced Warfare was beating Counter-Strike near its release, but that drop-off happened within a matter of days. Movement occurs, but it’s quick to re-settle, it seems. Here’s the question, though, what do you enjoy seeing most on Twitch? I find myself gravitating away from the most-viewed games and more towards the niche stuff, but that might just be because of my personal taste in releases. Note: We original had this as an official report from Twitch. That is not the case. This was a study done by EEDAR, a group independent of Twitch. It is not an official report.